I’m on the record stating my belief that photo apps space is the most over-saturated around. And it’s hardly a left-field claim: a quick look online shows more than 10,000 photography apps for the iPhone alone. There are just so many players in this space that it’s hard to know where to begin. Still, that intense competition doesn’t seem to have shaken off the belief of wave after wave of startups that think they can stand out from the crowd and become the next Instagram. Next up? French service Sharypic, which has just gone live on the iTunes store. The site, which is based in Paris but was funded by pan-European incubator HackFWD, offers a twist on the formula by focusing on events rather than people. The system is organized around real-world happenings, with pictures collated into albums that build events either by taking your location data or by users explicitly adding their images to a particular event. Right now, for example, you can see lots of photographs from Mobile World Congress in Barcelona, or the recent Rio Carnival. Navigating through the albums is easy and fast, and discovery of events — both through the app and the website — is smooth and intuitive. I suppose that makes it not entirely dissimilar to Color, the crash-and-burn startup that raised $41 million, flamed out with the press and users, and then shifted gears to become a Facebook photo and video app. But where Color had an expensive team and a bucket of money so large that left it vulnerable to launch hype, Sharypic is running lean and mean. And unlike, say, Instagram — which lets users apply retro filters to their photographs but really has no memory of what happened yesterday — Sharypic is centered around actual nostalgia. It wants to be there when you look back over photos, or help you discover what other people were doing at the same time as you. That’s an important human emotion, and while Sharypic’s approach to it is not unique, it is at least defensible. 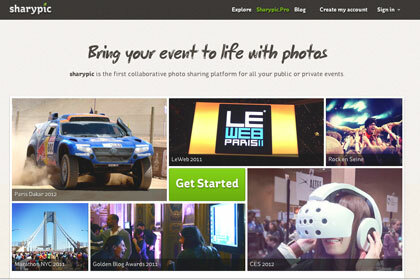 The site currently offers event owners and planners the chance to use a Pro version that will help them engage with attendees and collate photographs afterwards — something that gives it an actual business model, unlike many of its peers. But still, photo apps are so numerous that it still feels like a crap shoot. I don’t know whether Sharypic can make an impact. It’s a nice app, and with some smart event partnerships, it may stand a chance of making some headway. But at some point there will be a massive amount of consolidation or collapse: perhaps the best objective for anyone wanting to be in this space right now is to build a strong user base for when it all shakes out. oh my gosh i just spent time creating my first event + nothing is working can’t even sign up – what a disappointment don’t go live if can’t handle it u better call them in Paris and let them know they have issues!